Embroidery is such a nice thing to add to any sewing project to add a little bit extra personality beyond whatever it is that you’ve made. I’ve been doing a lot of it recently! After a rather involved violin I added to a t-shirt, I wanted to make something simpler. 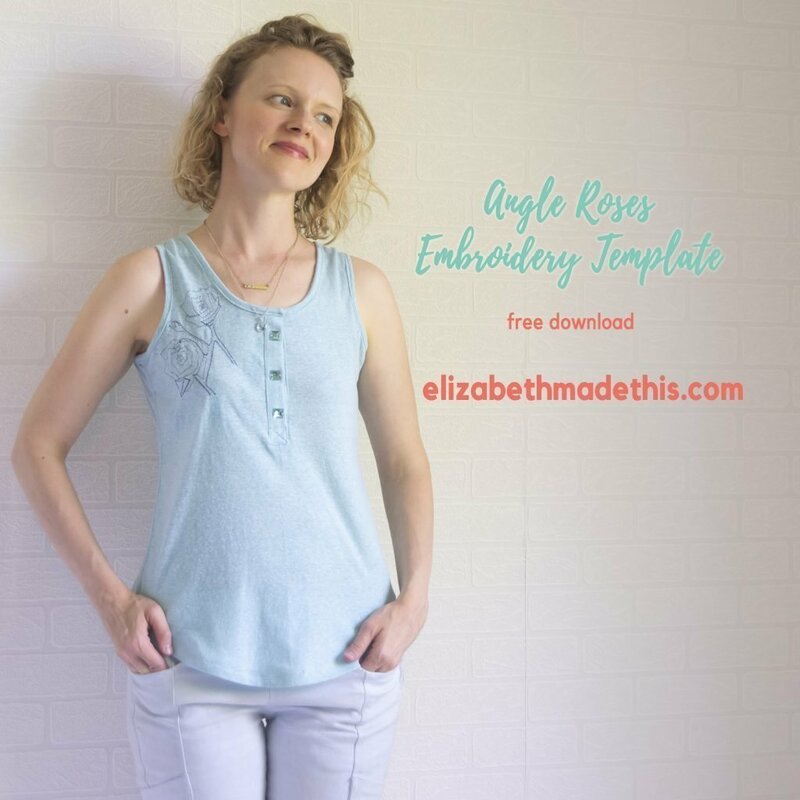 So I created this Angle Roses Embroidery Template, and I’d like to offer it to you today as a free download when you sign up for my newsletter. I’ve recently switched email clients. Before now I wasn’t able to send you happy mail or a download like this in it! The result was I never used my newsletter. 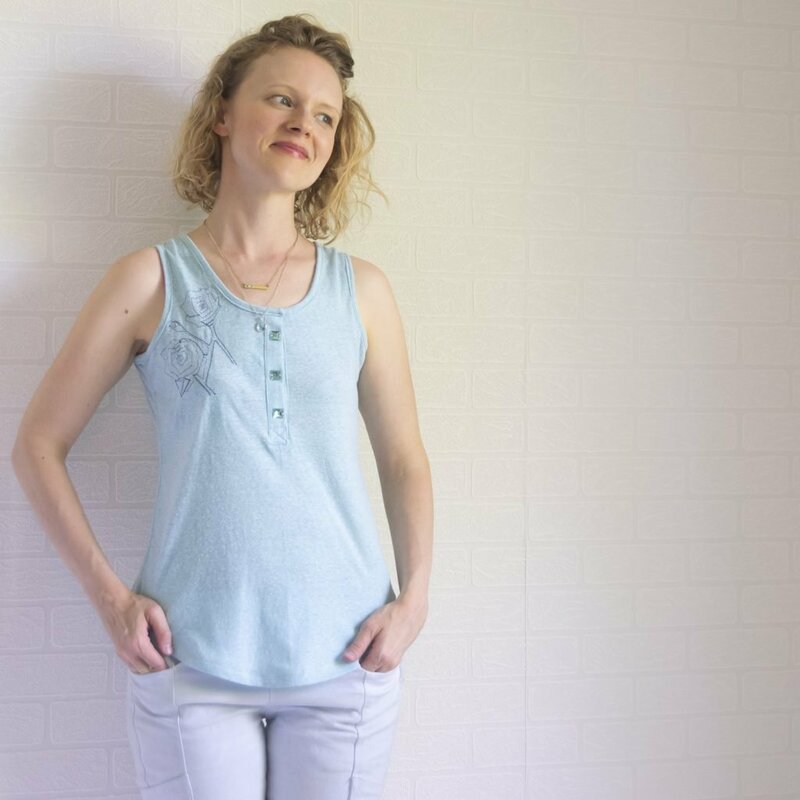 So if you’ve signed up in the past, this is the moment when I vow to do better to actually send you newsletters periodically that are full of good ideas to help you sew something creative today! The Angle Roses Embroidery Template for instance has a goal in mind of teaching you some basics of how to embroider on a regular sewing machine. Can I actually embroidery on a regular sewing machine? How can you use this design? You bet you can! You don’t even need a fancy foot to do so. 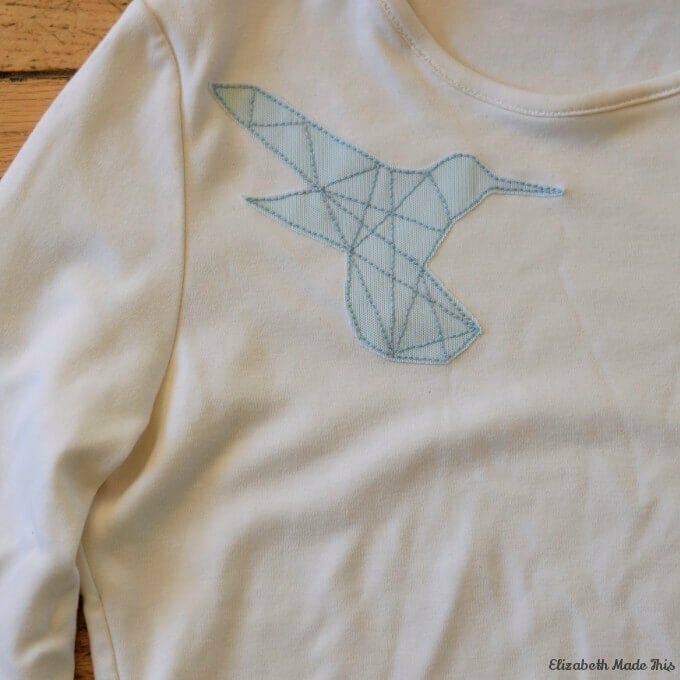 Embroidery on a regular sewing machine can be as simple as tracing a design onto a stabilizer and tracing along the needles as if it were a pencil. Plus, you can always make it more complicated if you want to. Here are some supplies that will help you, and then I’ll give some examples of how to spice up this basic design. Water soluble stabilizer–I really like Solvy by Sulky. It’s great for transferring a design and making some nice stitches. That you can wash it out in the end makes for stitches that won’t be damaged by pulling away the excess stabilizer as can happen in a lot of tear-away stabilizers. Fine line permanent marker–for tracing your design! 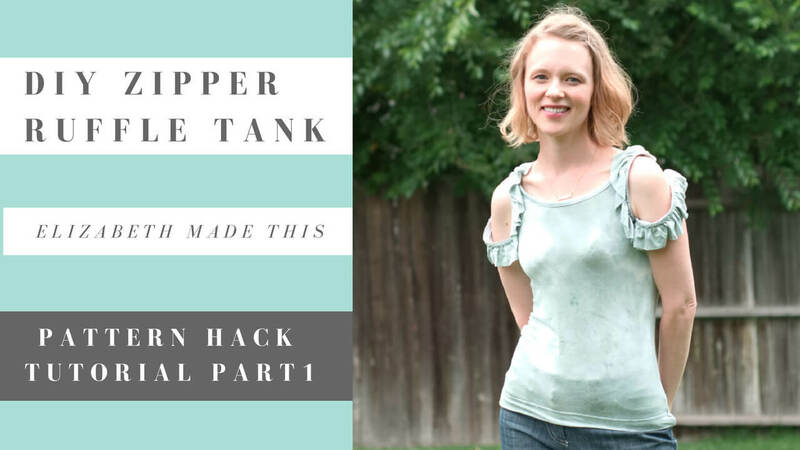 Uncut fabric or a project that’s already in progress: anything is game here, and you can even use this technique to embellish ready to wear items. Thread of your choice: contrast is key, so you’ll want to practice on some scraps if possible to help you make a good decision. Glue stick: For gently securing the stabilizer to your work area. Machine foot of your choice: I go into the advantages of each foot in the video for this project, but basically, my top 3 choices are straight stitch foot, clear applique foot, and a free motion embroidery foot. After you’ve downloaded the design, the PDF file will give you a tutorial and several ideas for how you can use them. I also give some basic directions to help you achieve what I’ve made. There’s actually a 5th level of difficulty here that I didn’t cover with this project but that I did get to in my violin t-shirt that I’ll talk about another day. It’s basically a hybrid of applique and embroidery, and it’s one of my very favorite techniques! The easiest way to incorporate the Angle Roses Embroidery Template is to simply stitch it out in one color. A good strongly contrasting thread will be a great choice. Here I’ve added to a Blank Slate Patterns Texana tank. Before you stitch out the design, add a little color to your fabric. Here I roughly stitched back and forth with my free motion foot to lay down some color. It’s amazing how much the character changes with this little addition! After stitching out the design, why not go back and stitch with some contrast thread to bring it into full color? 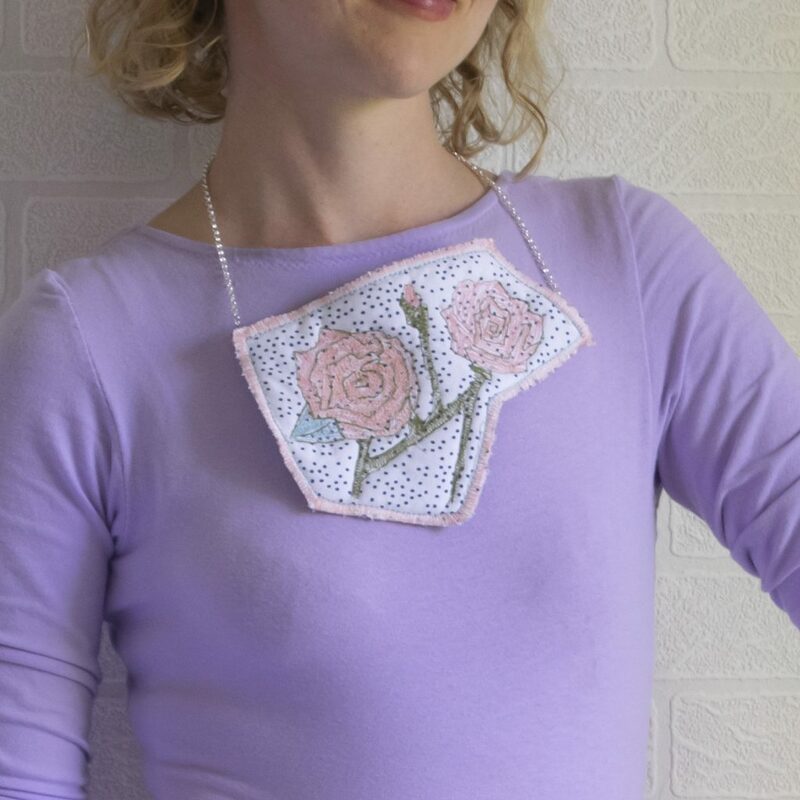 The roses came into full bloom in this funky quilted necklace. I’d love it if you would join the newsletter if for no other reason than I’m itching to see what you would do with this template! There’s so many possibilities! To make it easy to sign up, click on any of the pictures in this post or below, and it’ll take you to the sign up. Hi Elizabeth – – I love this post and everything you do as you know, so I nominated you for the mystery blogger award, details here….https://ellegeemakes.com/2018/07/15/the-mystery-blogger-award/ I hope you’ll join the fun!! Thanks Linda! You are so kind, and it looks like the comment bug got resolved (yay!!)! Really great tips for a beginner. Thank you. No doubt an embroidery machine will do the work faster and better, but not everyone wants or can afford a dedicated embroidery machine. So if you don’t have one and embroidery is something you do occasionally and not on a big scale, there are options to use your regular machine.